This 6 years old villa is artistically decorated and elegantly furnished with locally handcrafted teak furniture. It is located in a very peaceful and traditionally old residential area of Grand Baie. The village with its supermarkets, shops, bars, cafes, discotheques and beaches are easily reached on foot from Villa La Chaulee. Villa La Chaulee is quite unique in its kind. It was built with the purpose of receiving our sons who live abroad, our international friends and family, therefore whatever is found in the villa is of quality and of refined taste . Many guests who arrive for the first time in the villa are quite impressed, because we did not remove anything that were personal and dear to us. Everything was left in the Villa as if we were living there ourselves. The garden around the Pool is really nice and quite a rarity these days. Not many rented villas still have tall old trees that are over 50 years in their courtyard. Most of them have been cut down to make place for the construction of more concrete villas for rental. We are happy to have kept our beautiful old trees because they continue to inspire admiration to those who see them for the first time. Of course, there are bougainvillas, night jasmin, y-lang y-lang, hibiscus, flaming trees etc. and that the alley way from the entrance gate is bordered with tall Manilla Palm trees where creepers grow. Indeed, all the tropical plants are there also to remind us of the tropical origin of this Island. If you love nature and you are an ecologist and want to save the planet, you will experience what we, on a small scale, are trying to do. In summer (December, January, February, March) when the temperature can reach 36o C, it is marvellous to be able to jump out of the Pool and have your meals under the shaded roof of our beautiful pavilion. 4 large, thick rustic wooden benches and a mega table can accommodate more than 6 persons. There is always a nice breeze blowing in that direction coming from the East which makes it even more pleasant to enjoy your food. Barbecue can be organised, everything is provided for. Many guests coming for longer stay bring their hammocks and hang them on the pillars of the pavilion to sit and read or just watch birds in the trees and admire the sky. If you are tired sitting around the villa and garden, you can walk to the village (about 15 -20 min.) and go shopping. On the way from the villa on the main road, there are already, hotels, Italian & Mauritian restaurants, delicatessen, a supermarket, beauty salons, massage parlours, art gallery, football ground, sailing club, etc. Born in Mauritius, studied in London. Lived in Switzerland, Belgium, Africa and the Eastern Bloc. Enjoy living in Grand Baie now with my Swiss husband. We bought this property because we used to come very frequently on holiday here and spend time in this house. We loved it and decided to buy it and make it our holiday home. Since we decided to make Grand Baie our home base, we have renovated and enlarged the main house and built a separate 'Guest House' on the same compound. The 'Guest House' is what is being offered for rent. It is equally beautifully built in the typically 'creole style' with lots of wooden beams and ceiling, a scenic veranda that leads straight to the eco-friendly swimming pool, a kiosque for barbecue in the middle of a lush tropical garden with half centenary pine trees and flaming trees. It is really a dream place. Because of its location in a highly residential area of Grand Baie, it is very peaceful, quiet, zen, away from the noise of the main coastal road and the village. But it is still very near to bus stops and taxi stands and other public facilities, like restaurants, beaches, banks and super-markets. If you are looking for privacy, security and a perfect place to unwind, this is the place par excellence. The Ground Floor bathroom is spacious and has modern tiles on all four walls from top to bottom and on the floor. A large mirror affixed appropriately on one wall gives a bigger dimension to the room. More than adequate lighting is provided by two wall brackets and a chandelier. A large linen cupboard with 2 glass doors and a granite top is there for guests to lay their cosmetics and toileteries just like at home. Bath mats are provided for more comfort. The 2nd bathroom on the 1st Floor is equally beautifully tiled from top to bottom on all sides and on the floor. A lovely hand carved Indian oval mirror hangs on the wall while wall brackets and 2 chandeliers provide lots of light. Built-in cupboard with marble top provide ease and comfort to guests during their stay. A shower enclosure with modern sliding door makes taking a shower a joy. A separate toilet is a definite plus when more than 2 persons occupy the villa. Bath mats are also provided. Split system Air Concitioning installed in all 3 bedrooms. Ceiling fans equip the 3 bedrooms. Fans on stand are placed in kitchen, lounge and veranda. Clothes are normally hang outdoor in the sun and fresh air to dry. Parking space for 1 car is provided on the property. Towels for bathrooms and swimming pool are supplied. Kitchen towels and cloth are provided. Large living room with settees and sofas. TV with international channels and stereo equipment. No dishwasher but there is a house cleaner who does the washing up of dishes every morning except Sundays and public holidays. Large enough to freeze food for 1/2 weeks. Sufficient dishes and utensils are provided for 12 persons. These are renewed on a regular basis to ensure novelty. Modern fully equipped kitchen with all aminites. Dining area under the veranda with direct access to the swimming pool. A covered kiosque with large wooden rustic table and benches is set next to the pool for barbecue and outdoor dining. Lush tropical garden with tall old fir trees and flame trees mingled with beautiful flowering plants and crotons with their exuberant multi coloured leaves, scented plants like Ylang Ylang and jasmin. Shared by the Masters' bedroom and 2nd bedroom. Perfect place to relax among the trees and birds in the evening watching the sun setting and listening to the symphony of hundreds of birds singing. A covered kiosque with 4 long wooden benches and a mega wooden table is set near the pool for barbecues sitting 16 persons. At Mon Choisi Golf Club. Situated about 15 minutes by car. The villa is very convenient for children or teenagers as it is set in a very safe and quiet environment with Owner living nearby . It is very elegant and comfortable and one can sense this feeling of well-being and peace right from the moment you enter the property. Everything has been conceived to make the house habitable and hospitable. The veranda, which is actually the outside dining room, is furnished with large rectangular Teak dining table and 8 matching chairs. 4 deep seated cane sofas with matching round table are set charmingly in one corner while Indian hand carved coffee tables are spread out for living comfort. A slightly salty water swimming pool with beautifully coloured slates lining spreads straight from the veranda area. Living space around the pool is paved with large non-heating tiles. A pavilion with solid rustic wooden table and 4 benches offer outdoor living experience to our guests who like BBQ. Exactly as advertised with excellent hosts! Mireille & Gottfried were generous & hospitable hosts! It was so nice of you to have found us and for your friend to have approved your choice. We enjoyed having you here! Villa La Chaulée is an outstanding and luxurious family home who belongs to the Fahrni. It is exactly as the listing says and it is the finest villa we ever stayed in. The villa is situated in a magnificent location on the island's upscale area of Grand Baie and is nested in a luxurious tropical garden with a great number of plants and trees. The Fahrni built the place for their children with love and attention to every detail. It encompasses luxury space and confort. There is a very spacious reception room with abundant natural light which opens onto a large patched roof terrasse. The furniture is made for relaxation. The owners Mireille and Gottfried are perfect hosts and enjoy meeting their tenants if they wish to. Their house helpers are efficient and well trained to meet the highest standards. We had the perfect holiday in an exceptional setting. Do not miss staying at La Chaulée. Catherine and Nabil were the perfect guests that one always dream of having - a super nice couple, highly appreciative of everything and enjoying all that the villa had to offer as far as comfort, beauty and luxury are concerned. It was indeed a pleasure to share our Mauritian experience with them, our unique way of life that never fails to leave visitors on the island spellbound. Gottfried and I enjoyed thoroughly our numerous conversations with Catherine and Nabil during their stay here. Loved having you here! Please come back again any time! We will strongly recommend this property. The house is in perfect order with a beautiful garden with pool. Daily visits from gardener and housemaid made our stay really luxurious. But maybe the best part of our stay was Mireille and Gottfrieds extraordinary hospitality with fresh eggs and fruit from the plantation combined with limitless efforts to order transportation and sightseeing tours. They gladly go that extra mile for their guests. 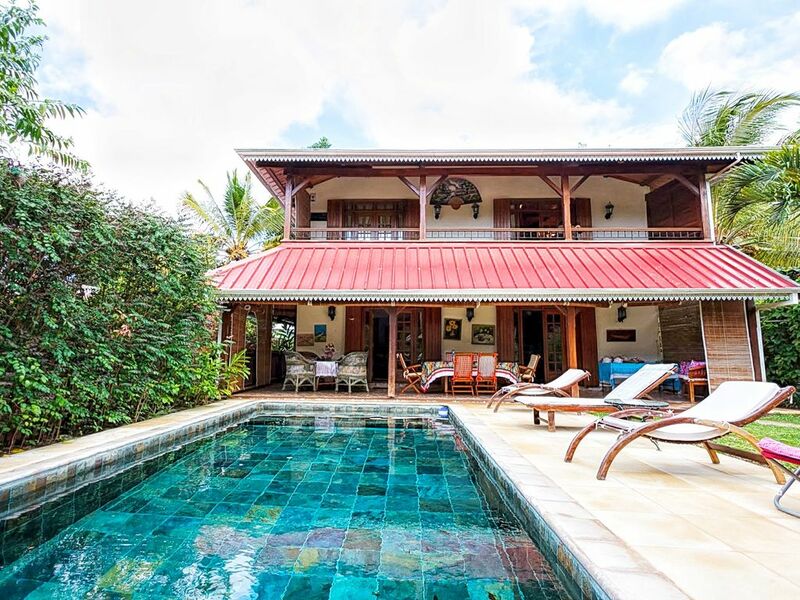 We recommend this property to anyone seeking a Mauritian holiday to be remembered for life. My stay was perfect, the staff were very helpful and villa in a great location near the Merville Beach hotel. I would definitely come back. Thank you for everything. Nous avons passé un séjour de 18 jours vraiment exceptionnel. Nous étions deux couples en famille. La maison est tout à fait conforme aux photos présentées sur le site. Grande, bien meublée, confortable, avec une terrasse bien aménagée et dans un jardin très verdoyant. Le tout bien entretenu par un personnel efficace et discret. Elle est située dans un quartier paisible et calme. Seuls les chants des oiseaux nous tenaient compagnie. Et proche du centre de Grand Baie. Quant aux propriétaires, Mireille et Gottfied, nous avons reçu de leur part un accueil vraiment chaleureux. Dès notre arrivée divers fruits, pains, confiture, etc avaient été préparés avec soin par Mireille . Et tout au long de notre séjour, nous avons apprécié ses qualités d'une hôte toujours disponible, et très compétente pour nous apporter des informations sur les plantes et arbres environnants, et à nous expliquer des recettes à base de végétaux. Mireille est une artiste dans divers domaines et ses explications sur ses différentes créations nous ont enchantés. Quant à Gottfried, toujours de bonne humeur, lui aussi n'a pas compté son temps pour nous servir de guide lors de la visite de sa plantation et nous faire connaître ainsi de nombreux végétaux et fruits que nous ne connaissions pas. Nous ne pouvons que les remercier, et le mot est faible, du temps qu'il nous ont accordé et ils nous ont ainsi fait connaître davantage leur belle île. Nous espérons pouvoir y revenir rapidement et bien sûr nous séjournerons à "La Chaulée" sans hésitation. This gem of a villa is even more lovely and spacious than the photos suggest. We were a party of 5, ages ranging from 10 to 68. We really appreciated the fact that the villa is properly equipped, like a real home, so you can easily cook meals or have a BBQ in the lovely garden. There is also a good sized pool, which my son really enjoyed. The owners live close by and were very hospitable, even giving us eggs and exotic fruit from their plantation. The location is ideal, because you can walk to Grand Baie on foot, yet the setting is tranquil and off the main road, so you can enjoy a relaxing stay. There is also a local supermarket less than 10 minutes away on foot, which was very handy. We all enjoyed our stay at Villa La Chaulee and found it to be the perfect home from home in Mauritius. Thank you, Karina, for your comments and appreciations. It is so nice of you to have taken time to do that. Yes, the villa is indeed more spacious and beautiful in reality than what is suggested by the photos. And I'm glad that you enjoyed cooking in our large and well-equipped kitchen and BBQ in the garden. Our goal is achieved when guests such as you, go away content and happy! Ski: This is a tropical Island, so the only ski we can practice is water-skiing. Most of the hotels in the North offer water-skiing in their boat-house. Above rates are for the rental of the property for 2 persons. For 3- 6 persons, please add Euros 10.- per additional person. Children under the age of 5 do not pay. For Peak Season (15 December 2017 - 15 January 2018) price stays the same for 2 - 6 persons. Possible discounts for stays for one month or over will be considered. In low seasons discounts will be given to families or small groups.